and now - well - I'LL I'M TRYING TO DO IS WAIT PATIENTLY. BUT I CAN'T AND IT'S KILLING ME AND I WANT THE BOOK NOW PLEASE AND THANK YOU. Isn't the cover lovely as well? AND THERE'S GOING TO BE A FILM FOR CINDER I JUST. I can't. and just to pain myself even further. Who want's a little snippet? “He leaned forward to inspect her closer. "Is that all hair?" ... Sudden, overwhelming panic clawed up Cress's throat. With a squeak, she ducked out of view of the camera and scrambled beneath the desk. Her back struck the wall with a thud that rattled her teeth. She crouched there, skin burning hot and pulse thundering as she took in the room before her— the room that he was now seeing too, with the rumpled bedcovers and the mustached man on all the screens telling her to grab her imaginary partner and swing them around. p.s you can read the first chapter here. Thanks for choosing Cress for your fangirl post! I really hope you'll enjoy it, and Book 4: Winter! 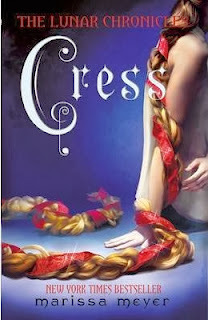 I haven't read this series yet but I hope you enjoy Cress! I'm dying for Cress to come out D; The synopsis sounds AMAZING. And Marissa Meyer commenteted on this post... HOW AWESOME IS THAT? *casually dies from the amount of amazingness on this post* I promised I would comment, but I didn't promise that it would be a sane one ;) I love this meme, fangirls FTW. There's going to be a film for Cinder?! Vaattt?! What is with all these YA books being turned into films all of a sudden?! I'm excited anyways!!! I haven't read the second book in the series yet but I did enjoy the first one (even though I did find it a little slow-paced at times)... Iko is my fave!<3 She better be in the film!! Guess I should really read Cinder then!